Alright, this information is a little bit more relevant to my portuguese watchers, but I'll keep it in english so everyone can understand it. The next issue of the alternative magazine Zona, Zona Negra 2, will be released on October 30th, on the Amadora BD festival. For those of you that don't know, Amadora BD is the largest festival dedicated to comics in Portugal, so this is pretty cool. 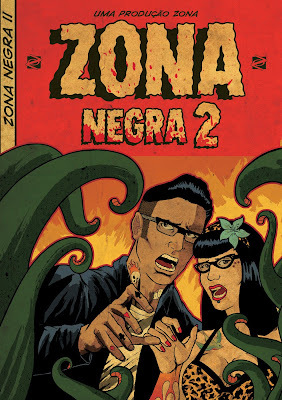 Zona Negra 2 is focused on horror, and has 96 pages of comics and illustrations in black and white, dedicated to the theme. In addition to that, it features an interview with Manuel Alves, a long-term collaborator. The awesome cover for this issue, that you can check out below, was created by Ricardo Reis. I, along with many other artists, will be there signing autographs on October 30th and 31st, so if you're in the area, please stop by! I collaborated with my friend, and co-creator of Kubrick's Garage, J.B. Martins, to create a 3-page comic. 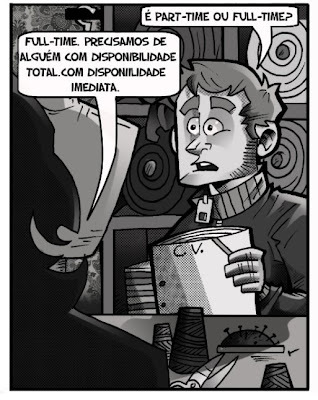 I can't show it to you yet - you'll have to buy Zona Negra 2 if you want to see it - but I can give you a little tease: here's a pannel from my comic.